For this Episode, join us as we talk to Lori Miarecki, the caretaker of Cherry Tree Inn Bed and Breakfast. 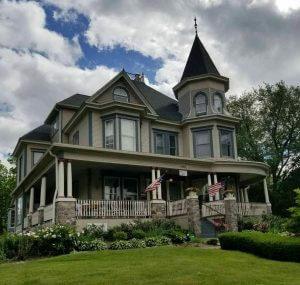 Movie fans may recognize this iconic bed and breakfast as Bill Murray’s backdrop to his repeatable day in the movie, Groundhog Day. But unlike popular belief, it’s actually located in Woodstock, Illinois, 45 miles outside of Chicago. Listen in as we talk to Lori about her experience, why she bought it, and why you should visit too. This episode’s Drink of the Day was Simply Orange High Pulp juice (the pulp is important). Ren almost finished all 52 ounces! Woodstock Farmer’s Market, open Tuesdays and Saturdays. Ren’s favorite local donut shop is Krumpe’s, located in Hagerstown, Maryland. Hours are 7pm until 2am and the donut of the month is definitely Strawberry Shortcake. You can find them on instagram or on twitter. #4: Vagablasers, Traveling the World. Take a listen here to find out more about their story. Thanks for listening, peace be the journey!